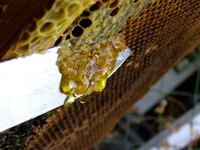 Queen bee excluders are wire-mesh frames inserted between the brood chamber and honey chamber of a beehive. The openings in this wire frame must be the right size—no larger than 0.163 inch wide—so that workers can fit through but the queen and drones, which are larger, cannot. Worker bees can access the upper levels to build combs to store the hive’s excess honey without the queen laying eggs in this area of the hive. Hardware cloth is available at home improvement and hardware stores, usually in lengths of 2, 3 and 4 feet. Select hardware cloth with openings that measure 1/8 inch. Choose the smoothest, highest quality mesh available, as it will ease the passage of worker bees between the wires. Measure the size of your beehive to determine the length and width of the excluder frame. Cut two pieces from the pine furring strips for each side of the frame with a circular saw, so you end up with four short-side pieces and four long-side pieces. To ensure straight cuts, consider clamping the wood strips to a flat surface and using a metal edge to guide your cuts. Construct one side of the frame by fastening two width-wise pieces to two length-wise pieces with wood screws. The resulting rectangular frame should fit snugly within the interior of the beehive at the top of the brood box. Repeat to make a second frame. Cut the hardware cloth to the size necessary to completely cover one frame using metal shears. Snip off any jagged edges that may protrude from the perimeter of the frame. Staple the hardware cloth to the frame, being careful to keep the mesh taut as you work. Fasten the second frame to the mesh-covered frame using nails. Seal the wood using sealant, which will help reduce wear and tear from moisture and ease cleaning. Always wear safety glasses when working with power tools, especially saws. Wear safety glasses as you cut the metal mesh, as well, to prevent injuries from flying metal splinters.